I recently had an urge to do some sewing, and particularly wanted to return to trying to make my own clothes. I first attempted this years ago. I made two skirts (badly) and then promptly gave up because the logistics of it were too hard in a shared house with a tiny kitchen table and me being in the box room. One of the perks of my husband and I having our own place now is a lovely large dining room table, with plenty of space for me to spread out my creative projects. If it's not finished by the end of the day, I can just close the door and don't have to worry about clearing it up. It's much easier to pick up then when I next have the time. 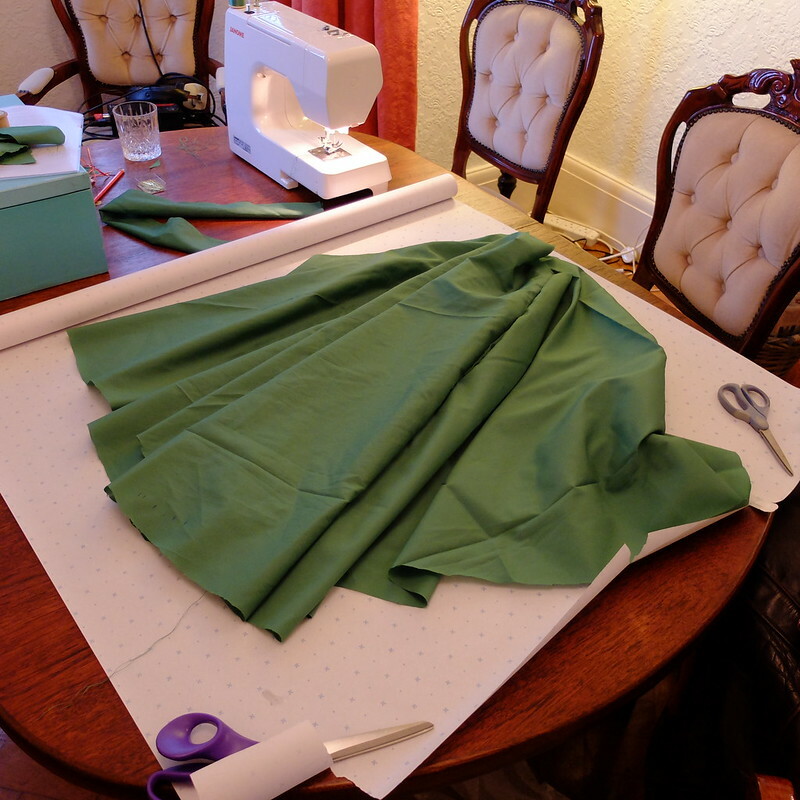 A practice circle skirt under construction! My first step in returning to sewing was to assess my resources. I have a decent modern sewing machine (a Janome), and a huge collection of threads, buttons and ribbons that I've collected like a magpie over the years. What I realised I was lacking was fabric. To a novice, choosing fabric is pretty bewildering to be honest. I'm really fussy about patterns and colours, and I have a tight budget yet expensive tastes (like in most areas of my life!). I visited a few fabric shops, and just felt more confused than ever seeing things in person rather than online. I decided then to just pop to the charity shops and see if I could find some old sheets or something to practice on, and then I'll have more money to invest in some nice fabric at a later stage when my sewing skills are improved. I was in luck, not only did I find two lovely vintage patterned sheets, but a keen sewer had dropped off all their fabric remnants, and I came away with a big bundle for under a tenner. In the bundle I had a pink lightweight cotton, a pale eau de nil mystery fabric, a stripe stiff cotton, and a drapey dark teal viscosey type fabric. I love the daffodil and tulip print sheet and the white and green flower print sheet too, but now I think they're too nice to practice on and I should save them for something good! I also ended up buying a pair of curtains from the jumble sale for £2 and that's been my 'test' fabric, along with a really nasty green synthetic fabric that was in my craft stash. Great to have something to practice on without worrying about ruining a lovely (and pricey) fabric. As for patterns, I've downloaded some free ones from Colette and Vera Venus among others freely available on the internet. I also mentioned I'd like to learn to sew properly to my husband, and he came back from the charity shops with half a dozen vintage patterns for me to try out. Some are too big and some too small, but I've looked into resizing patterns and it doesn't look too hard. I'll give it a go! I have also bought the 'Coco' pattern from Tilly and the Buttons, as that's supposed to be pretty foolproof with its level of detailed instructions. Anyway, I'm not aiming to save money by sewing (all the kit is pricey, I've already had to buy new tailor's scissors, pattern paper, zips, bias, buttons, fabric, patterns etc.) but I will be able to make one thing that will have a clear benefit to tall me: skirts that are actually long enough!! The picture above is of a circle skirt I'm making that hits mid calf on me. Hurrah! It's also really quite fun learning to sew, and at the very least I hope I can make some curtains or something else useful for around the house. Exciting project! I hope it goes well this time! Oooh! I cannot wait to see what you come up with! I can't wait for updates, I've got the ug too at the moment but I can't even sew a button! Loved the peak at your old post! I felt a bit embarrassed sharing such a dodgy old post!! There's little more empowering than sewing your own clothes - come up with a weird idea and a few hours later an outfit no-one else in the whole wide world has but you. I've never bought fabric new, like you I'm totally confused and anything remotely affordable isn't at all attractive. 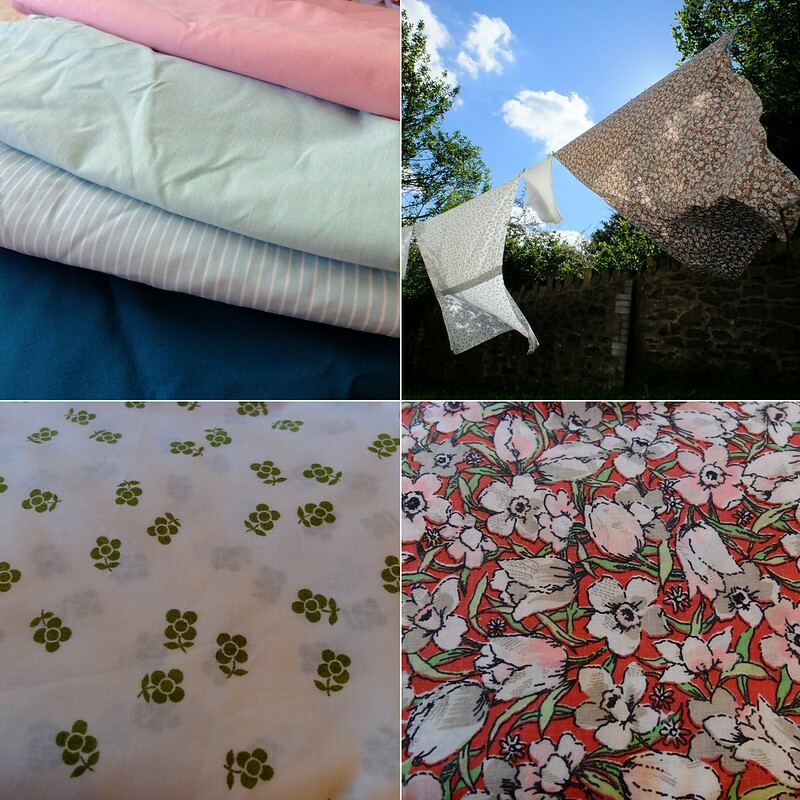 Vintage sheets, curtains, duvet covers and throws founds for pence at car boots, jumbles and chazzas or hand-me-downs from friends all the way. Notions don't have to be expensive. If you've got a large Asian community like we do you'll find cheap supplies as Indian ladies still mostly sew their own clothes. I pay 50p a metre for bias binding and everything else (zips, buttons, trims) I chop off tatty clothes found on the clearance rail in charity shops. I've never bought a zip new but a couple of sewing buddies recommend continuous zips - sold by the roll - from eBay. You are doing so well! Super organised and thinking everything through! I can't recommend Craftsy courses highly enough. They have some fab courses for every level sewing! Looking forward to your progress! Best of luck to you, my dear friend. I really admire your desire to create your own clothes immensely and hope that the final version of this skirt comes out aces for you. Good luck, I look forward to seeing what you come up with! I have been toying with the idea of taking up sewing for a while now, and a few weeks back I actually went and looked at fabric. However I did not have any luck finding any fabric that was vintage appropriate and I left feeling a bit jaded. I would love to know where the good repro brands get their fabric! Exciting times! It is such a joy to make things. I can sew but count myself as a beginner and I want to do more of it, especially as I work in a haberdashery full of all the gorgeous things! !